The South African Police Service has two weeks to submit what actions were taken, from January 2014, to bring suspects to book in the murder of the former Rwandan head of intelligence, Colonel Patrick Karegeya. "The magistrate is of the opinion that the decision to hold a formal inquest is that of the judicial officer and not of the prosecution. "It is, therefore, premature to hear oral evidence in the light of a number of outstanding vital statements and information," Magistrate Mashiyane Mathopa said in his judgment on Monday in the Randburg Magistrate's Court, before striking the matter off the roll. 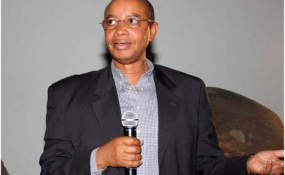 In 2008, Karegeya sought asylum in South Africa after he had a fallout with the Rwandan government and set up an opposition movement, the Rwandan National Congress. He was found dead in a hotel room at Michelangelo Towers in Sandton in 2013. Four years after the assassination, the National Prosecuting Authority (NPA) submitted the matter to the magistrate for an inquest to be held after AfriForum, on behalf of the Karegeya family, approached the court. Advocate Gerrie Nel last Wednesday argued that the inquest was merely a means to cover up the inaction of the police and the NPA, and therefore submitted that the matter should be set aside and head for prosecution, as the suspects were "well known". Magistrate Mathopa requested on Monday that the investigating officer (IO) produce the following within 14 days: The steps taken to arrest the Rwandan suspects; the steps taken by the IO to comply with instruction of the Director of Public Prosecutions; as well as the steps taken by the IO to address discrepancies highlighted by the office of the head of the Forensic Science Laboratory. Mathopa also asked that the IO attest all statements and file certified copies with reasons explaining why the original statements and documents were not submitted. Nel, Afriforum's head of private prosecutions, welcomed the judgment. "I thought it was very fair and well reasoned for the police to report back within 14 days on what steps were taken to bring the suspects to book. "When we brought the application to the court, this what we wanted to know," Nel told the media outside the court. Karegeya's widow, Leah, who was present during Monday's court proceedings, remains hopeful that justice delayed will not be justice denied. "The truth will always prevail, that is my conviction," she said.